It’s people who make organizations great, so how can leaders best help their people achieve that greatness? As Ken Jennings and John Stahl-Wert show in this new edition of their bestseller, you can’t just demand greatness—you have to inspire it. The most effective leaders don’t just stand in front of their people, they stand behind them too. As one of the characters in the book notes, “You qualify to be first by putting other people first.” This concept sounds paradoxical, but it leads to extraordinary outcomes—and The Serving Leader shows precisely how and why. 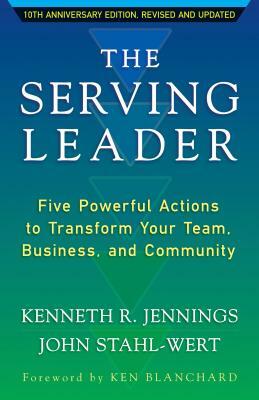 On one level this is the most practical guide available to implementing Serving Leadership; on a deeper level, it is a book about the personal journey of growth that real leadership requires. Great organizations are great because they’re filled with people who freely choose to do their very best. It’s a maddeningly simple concept yet stunningly hard to execute. Jennings and Stahl-Wert show leaders how to earn that kind of commitment. "This developmental model works. Jennings and Stahl-Wert nail the fundamental necessity that leaders embrace service to others, especially their staff, in order to achieve their mission and vision. We have seen the fruit of a Serving Leader approach pay dividends in the development of our staff members. The narrative of The Serving Leader beckons the reader with the question, ‘How can I find the same significance in my work that Mike finds through these practices?’ This is a must for HR professionals who want to change the game in their organizations."